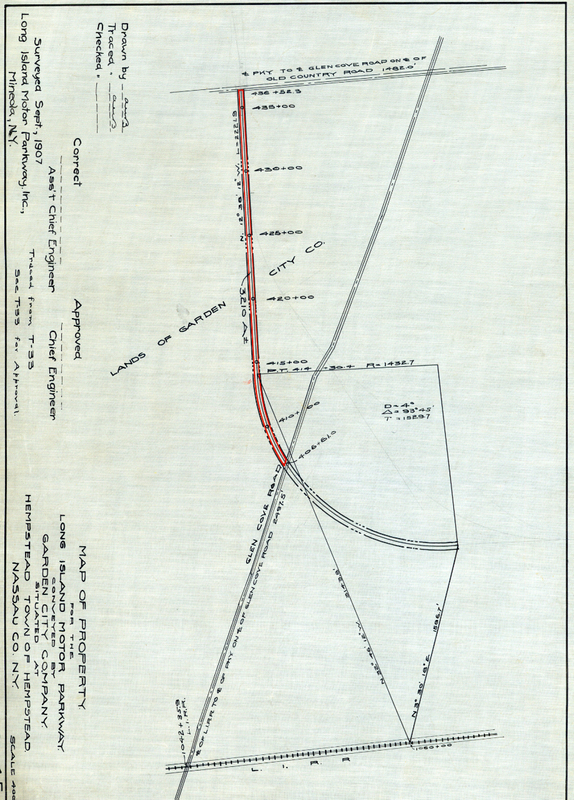 This is the 1907 survey of the land bought by the Motor Parkway from the heirs of A.T. Stewart. The right-of way was primarily only 50 feet rather than the typical 100 feet or larger. My favorite co-author Al Velocci believes that this section had already been subdivided by the Stewarts' Garden City Company and only 25 feet could be carved out from both sides of the subdivisions. 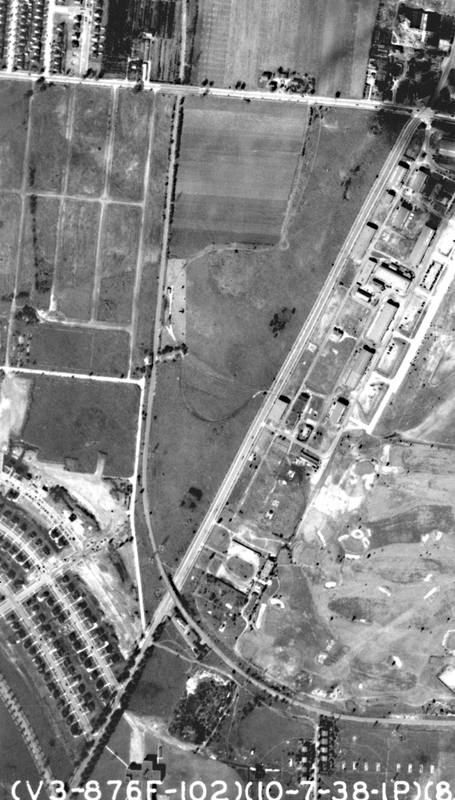 This 1938 aerial shows the entire 0.9 miles of the Motor Parkway in Garden City from Old County Road to just past Raymond Court. In the lower-left corner of the aerial, the first road west of the Motor Parkway is Russell Road, which eventually would run parallel with the Motor Parkway to Old Country Road. This 1950s view shows the Motor Parkway right-of way looking south from Old Country Road. Several concrete posts can be seen on the left.The houses on the right are located on Russell Road. Note: At this time, the fences of these houses did not intrude on the 50-foot right-of way still owned by Nassau County. Sometime in the 1950s, Nassau County gave the residents of Russell Road an offer they could not refuse..and no one apparently did. For the sum of only $175 each resident purchased the Motor Parkway right-of-way behind their houses. A current Google Earth view indicated that little, if any, of the Motor Parkway pavement survived. But, the question remained: Did any Russell Road resident preserve their piece of history? Last Monday, I received my answer. Arthur Jasper, a 40-year resident of Russell Road, contacted me and invited me to see his backyard. There it was: The Motor Parkway complete with its two three-foot concrete extensions being used as a beautiful garden porch. Arthur believes this is the only complete section of the Motor Parkway that remains behind the Russell Road houses. Hats off to Arthur for preserving his own Motor Parkway! In a few days, I will explore another oddity in this section....often referred to as the "Mayan Ruins" of the Motor Parkway. Marty HImes told me many years ago that there were buried sections of the MP that still existed but I am not sure if they were Russell Road. The town ought to landmark Arthur’s section, if it is the only large piece left, so that any future owner of the property will not have it dug up and carted off to the landfill. Howard, thanks for putting the information up. And thanks to Howard for preserving the roadway. Hats off to Arthur! That was a nice shot of the LIMP in his backyard.